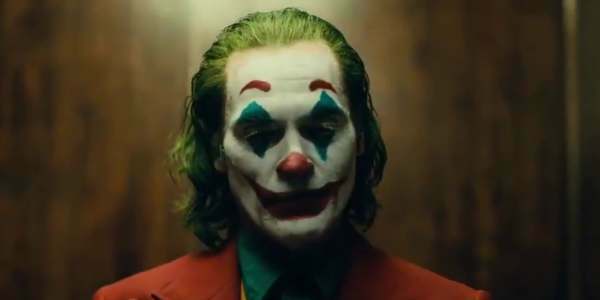 Find out everything you probably missed in the new Joker trailer. 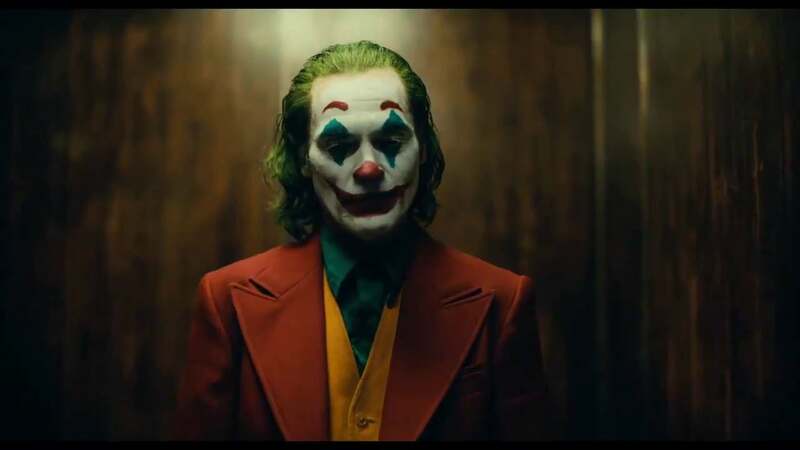 The first teaser trailer from director Todd Phillips Joker origin movie was shown at CinemaCon in Las Vegas on Tuesday and was released online Wednesday morning. It's arguably the most grounded and bizarre comic book movie in history. Joker doesn't feel like a comic book movie and there isn't a superhero in sight. There may not be a villain. We'll see. 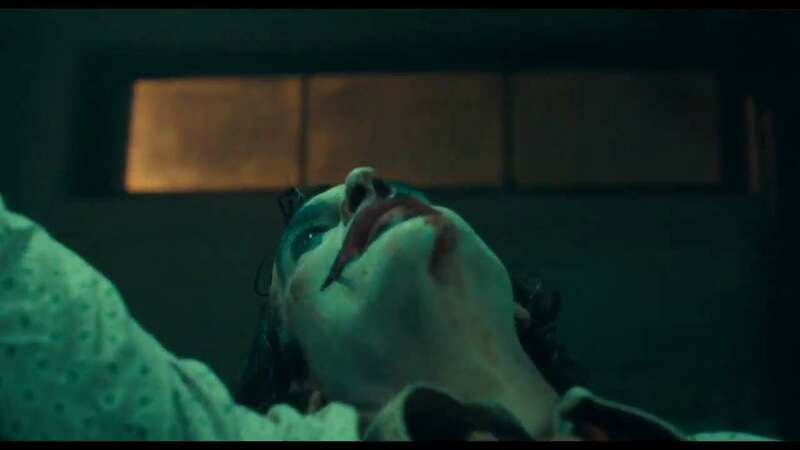 Here are some things you may have missed in the first Joker movie trailer. The trailer opens with a shot of Arkham State Hospital. 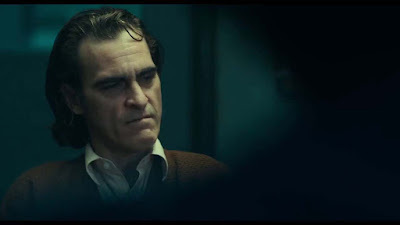 Then it cuts to Arthur Fleck in therapy. 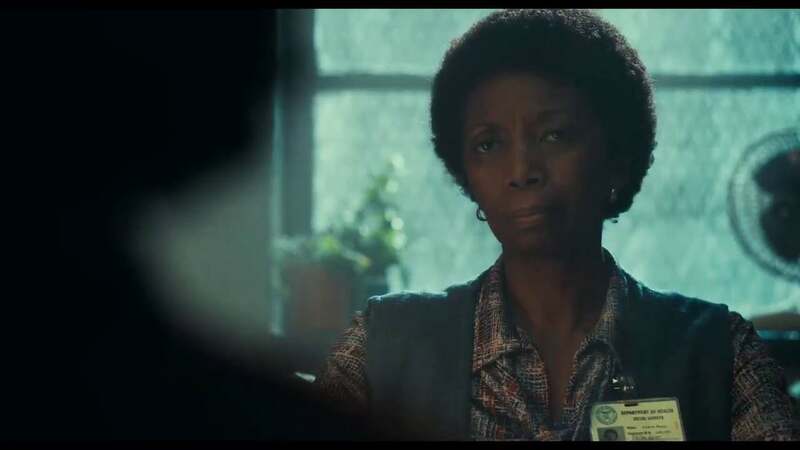 The name badge shows he's with his social worker Debra Kane (Sharon Washington). She asks if it helps "having someone to talk to". Debra shares the last name of Bob Kane the co-creator of Batman. So he gets a shout-out. Plus, Bob's daughter's name is Deborah. Different spelling but said the same. Fleck sneers and says "My mother always tells me to smile and put on a happy face." Then it cuts to several scenes at home with Fleck's mother, Penny (Frances Conroy) laughing together. "She told me I had a purpose," he says. "To bring laughter and joy to the world." It's noteworthy that he's talking about his mother in the past tense even though it's clear he loved her deeply. Her death could have been the first of many straws that breaks Fleck's back. There have been rumors that his mother is ill and he comes back to take care of her. Rumors also say she worked for Thomas Wayne. Could that set him off? The song in the Joker trailer is "Smile" sung by Jimmy Durante. It was first sung by Nat King Cole back in 1954 and was written by John Turner & Geoffrey Parsons with music by Charlie Chaplin. The lyrics have several ironic tie-ins to the movie. The first words by Fleck and the first poster all point to the irony of smiling while in pain. We know Fleck is a failed comedian. Fleck's writing jokes and has a rather dark one scrawled on the page. 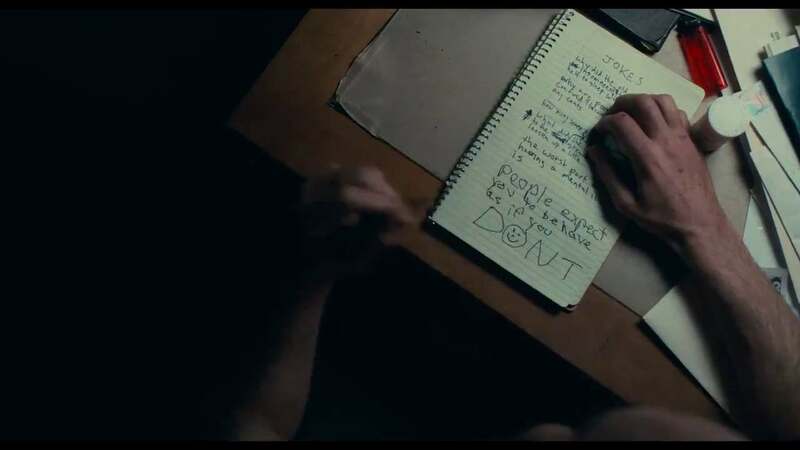 "The worst part of having a mental illness is people expect you to behave as if you don't" with the last worsts scrawled in big letters and a smiley face. Ominous. Plus, there a bottle of medication next to the papers. Anti-psychotics perhaps? The reference is from the classic Alan Moore graphic novel The Killing Joke. 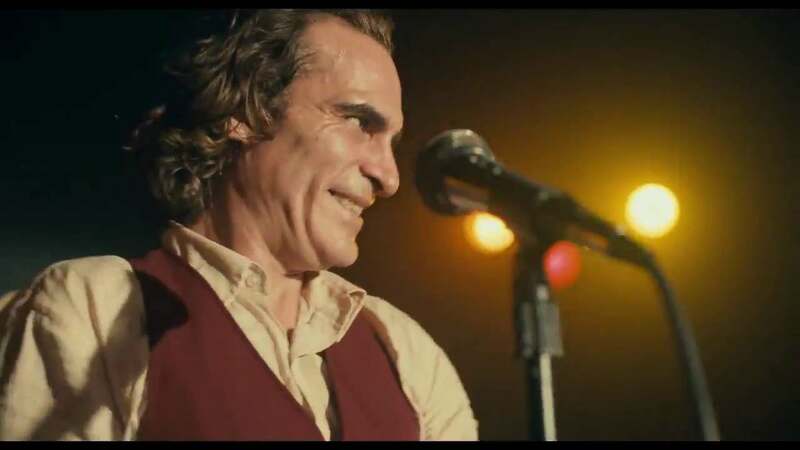 In that story the joker is an aspiring comedian trying to care for his pregnant wife. There have been several shots of Fleck in full clown make-up. We don't know the reasons for them all but one shot shows him as a sign-holder for music store going out of business. He's dancing, spinning and twirling a big sign that says "everything must go". Clearly, he enjoys it, but then the first of many terrible things happen. Some street punks steal his sign and he chases after them into an alley. They beat him up and leave him. Maybe even rob him. It's the second time we see the pain in Fleck's life. The movie is set in 1981 and all the cars are vintage. Maybe because of the attack or something else we see big bruises on Fleck in a locker room. The physical pain may be mirrored in his mind. Phoenix is also very skinny in this role. He's lost a ton of weight. "Is it just me?" Fleck asks in the voiceover. "Or is it getting crazier out there?" We get flashbacks of Fleck with his mother dancing and laughing in happier times. 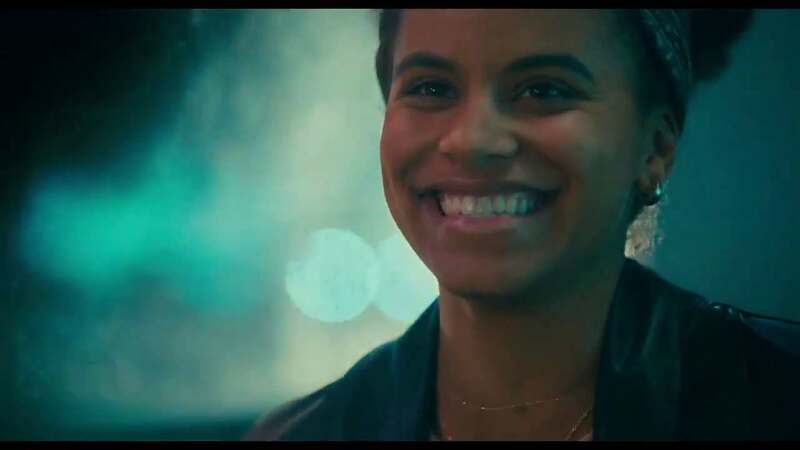 Then we cut to a donut shop where he and Sophie Dumond, played by Zazie Beetz (Deadpool), are eating and talking. More laughter but it doesn't seem like it lasts. Fleck is shown heading into Arham State Hospital for an unknown reason. Maybe he dresses as a clown for the kids? Maybe he's visiting his mom? We don't know but we do know there are some very ill people there. He closes his eyes and clenches his fists while a man strapped gurney screams. The handlers don't seem concerned so this may be the movies interpretation of Arkham Asylum and everyone in there is like this. Arkham Asylum is a reference to the comic book mental health facility known as the "Elizabeth Arkham Asylum for the Criminally Insane" or simply "Arkham Asylum". 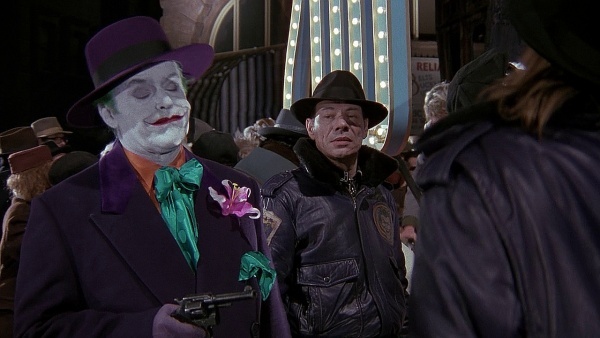 Several villains have been patients at Arkham including Two-Face, The Riddler, Poison Ivy and The Joker himself. There's a theory on Reddit that the green question mark is a reference to Edward Nygma aka The Riddler. But we'll have to wait and see. 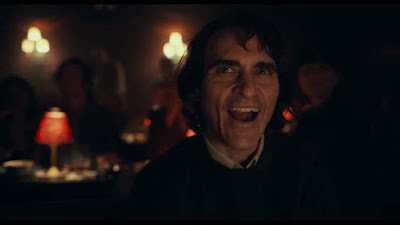 Arthur Fleck is in the audience of Pogo’s Comedy Club laughing. The laugh is a strange one and not one he uses later in the trailer. Is he mocking the comedian on stage? Maybe one of his rival comedians? Or is he supporting him? Fleck is putting on his make up in a makeup chair. As he does it he's crying. In an effort to "smile" he pulls his lips back in a bizarre grimace as his makeup runs down his face. This is the first version of the Joker makeup we see and not the last. For the second time in the trailer, Arthur is attacked. 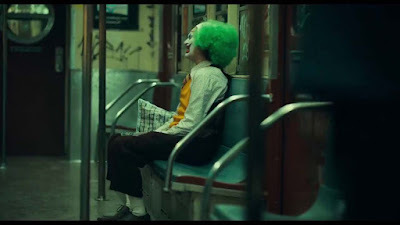 While he's riding the train in his clown makeup he starts howling with laughter. Three men dressed in suits ask him "what's so funny?" as he breaks down in tears. They punch him to the ground laughing and call him a "freak". 14. Gotham's "Lost It's Way"
The Joker trailer shows Fleck running through the city as Joker, now in full makeup. He's dancing as Thomas Wayne says "Gotham has lost its way". The suit Fleck is wearing is very similar to one worn in a different movie. More on that later. We see "Wayne Hall" is showing a classic Charlie Chaplin movie called "Modern Times". Modern Times is a 1936 comedy film written and directed by Charlie Chaplin. 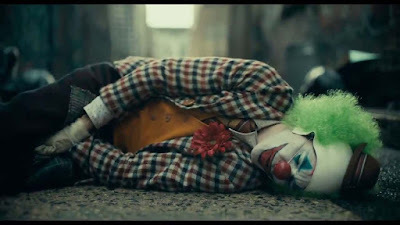 It tells how his iconic Little Tramp character is struggling to survive in the modern, industrialized world. The movie was an attempt by Chaplin to show how people, suffering through the Great Depression were suffering because of modern industrialization. We don't know how that plays into the Joker movie but it clearly touches a nerve with the crowd who's shown up to protest. This scene is also the first of many references to Batman's father Thomas Wayne played by Brett Cullen. For some reason, the police throw Arthur Fleck out and he falls down the stairs. There are a lot of shots of going up and down stairs while may be symbolic of his rise and fall. Fleck is holding a gun. 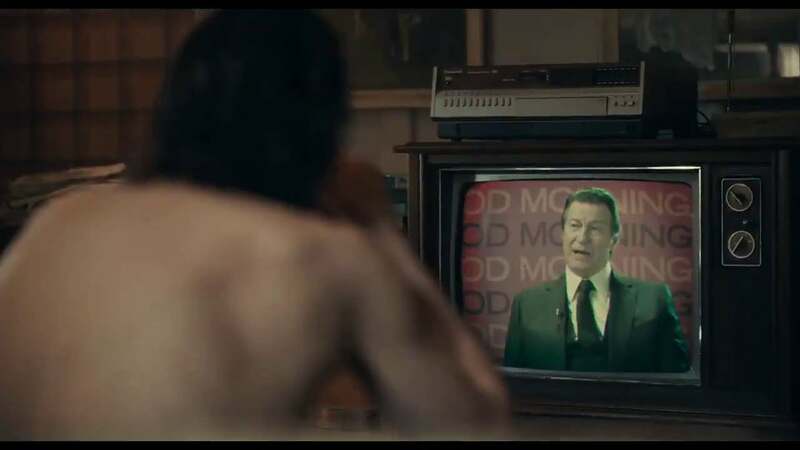 He's watching Thomas Wayne on television as he says "What kind of character would do something so cold-blooded? Someone who hides behind a mask." 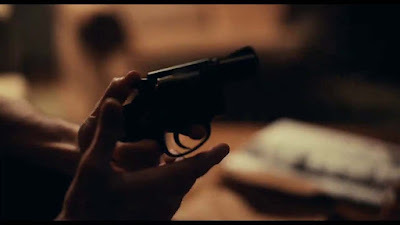 The gun Fleck is holding is a revolver. In the Batman 1989 film, Jack Nicholson's Joker also uses a Colt New Service revolver so it's a nice reference. Fleck is in his mother's apartment and we see doilies lying around. 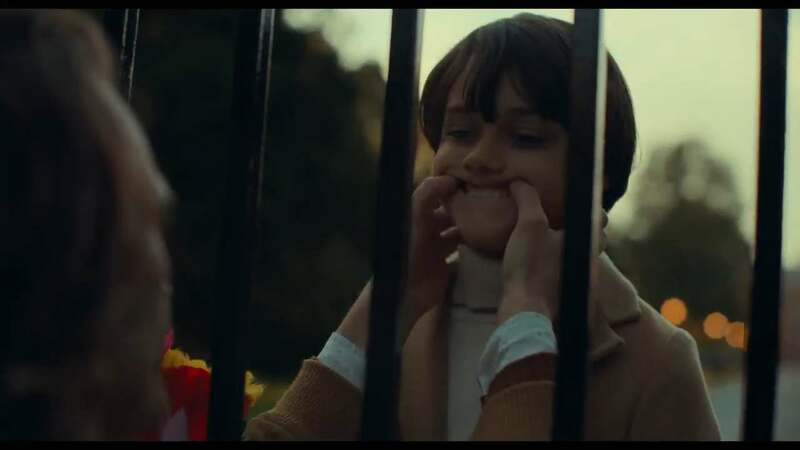 Thomas Wayne's interview isn't just about social commentary. Set photos reveal that he's running for mayor. This may not sit well with Arthur or the city. 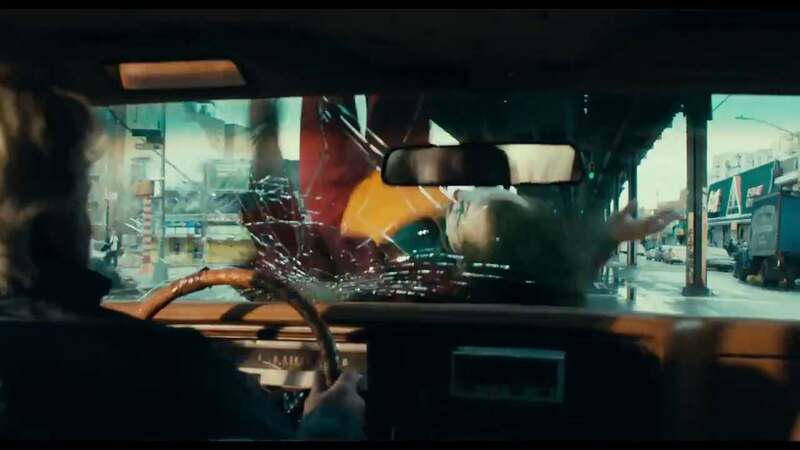 Several scenes of the police chasing Fleck through crowds show the chaos in Gotham City. 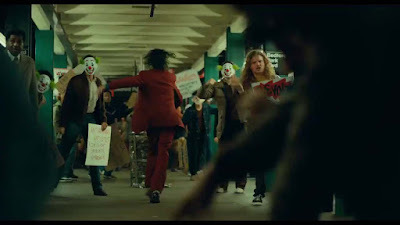 The Joker movie behind-the-scenes videos and photos have shown Fleck in the middle of street protests and demonstrations. Like the "Occupy Wall Street" protests a while back the protestors wear masks. But unlike the Guy Fawkes masks of Anonymous, these protesters wear kid's clown masks. 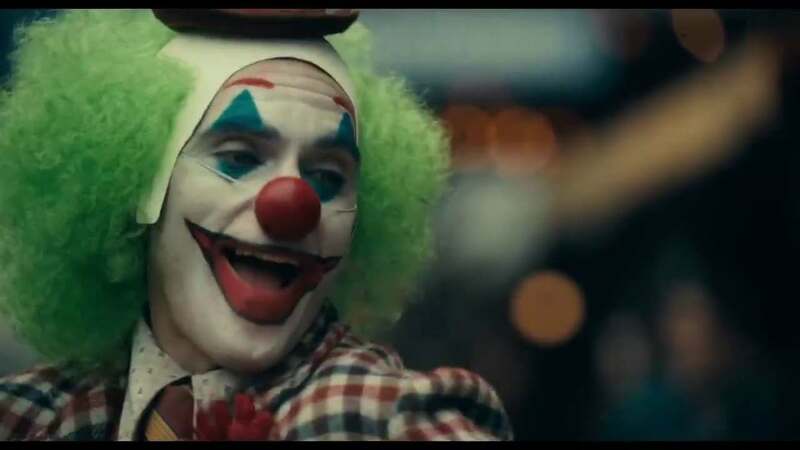 In a park we see Arthur Fleck playing around wearing a red clown nose. Finally, we see him using his fingers to make a little boy smile. We won't see Batman but we will see Bruce. The boy is young Bruce Wayne played by Dante Pereira-Olson. Are the two friends? 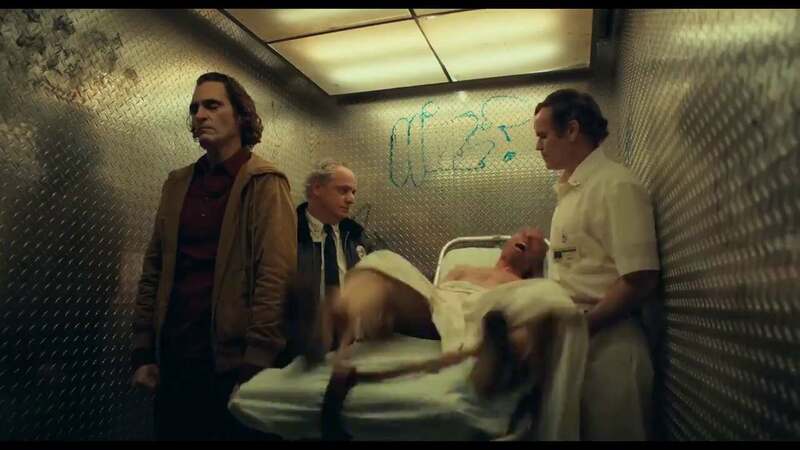 The Joker trailer then shows several cuts of Fleck on stage, dancing, smoking and then slamming his head into a glass window. "I used to think my life was a tragedy," he says." But now I know it's a comedy." Hilarious. 21. 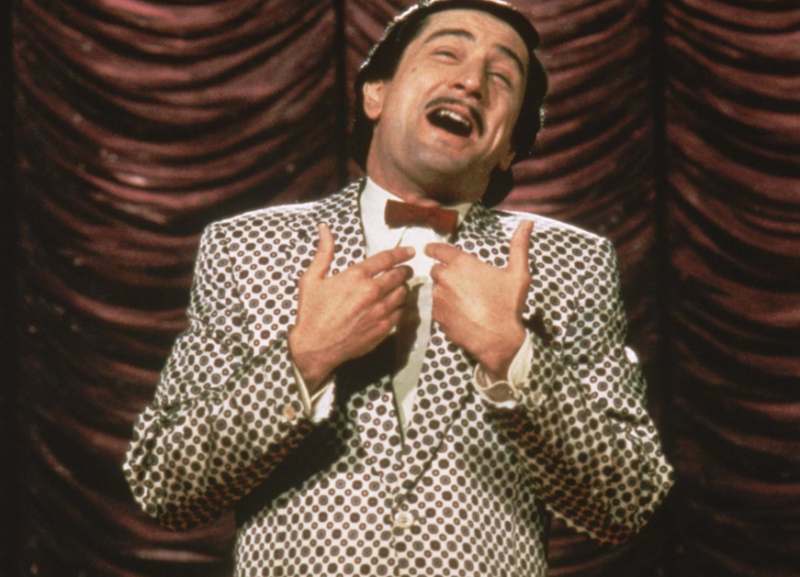 Scorcese Gets a Shout-Out for "Kings of Comedy"
The movie was produced by Martin Scorcese and one of his most well-known works is the 1982 black comedy film The King of Comedy. It's about a comedian named Rupert Pupkin who kidnaps a late night talk show host to force him to give him a slot on his show. Director Todd Philps has said his Joker movie is going to be like a Scorcese film. 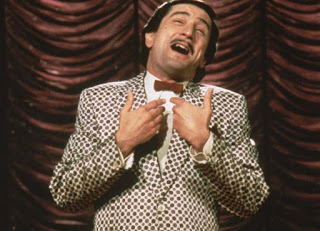 Robert DeNiro plays talk show host Murray Franklin in the movie and it's a nice nod to that film. Plus, earlier we see Fleck wearing a suit eerily similar to the one worn by Pupkin. Fleck is also a comedian and is set to come on stage in his full clown make-up. After that, we get a few shots of protests before a shot shows him running down the halls. Then he's hit by a taxi. This another reference to a well-known Scorcese film Taxi Driver. In the 1976 film, DeNiro plays Travis Bickle who slowly descends into madness as he plots to assassinate political figures and several others. This could also be a plot reference since Fleck is descending into madness and could be plotting the assassination of Thomas Wayne. 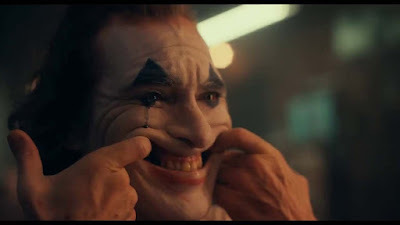 The trailer ends the tagline "Put on a Happy Face". 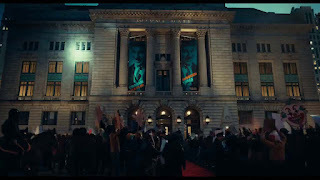 It also shows Joker dying his hair a sickly green, going down a staircase and going into an elevator in full Joker costume. Todd Phillips has said the movie is going to go in directions we don't expect. The trailer is insane and lives up to that promise. 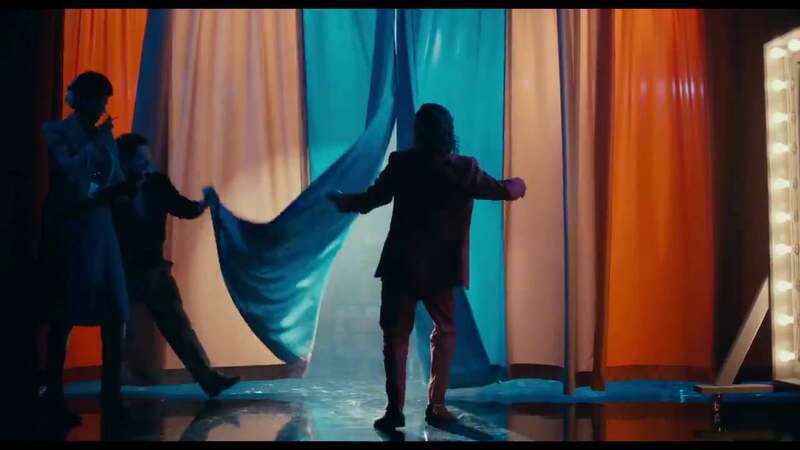 The movie opens on October 4, 2019. Official synopsis: "The film 'centers around the iconic arch nemesis and is an original, standalone story not seen before on the big screen. Phillips' exploration of a man disregarded by society is not only a gritty character study, but also a broader cautionary tale." What do you think of the first trailer? Let us know in the comments below!